Has Bill Bolling left the building yet? Hey, Mark Warner, don’t you really want to be governor again? Their consternation is the result of what could be called the “April Fools’ Week Massacre.” A string of news reports appearing from March 30 through April 5 punctured the gubernatorial campaigns of Republican Attorney General Ken Cuccinelli and former Democratic National Committee Chairman Terry McAuliffe, the unopposed candidates for their parties’ nominations, while tarnishing the reputation of Gov. Bob McDonnell. The first blow was a March 30 report in The Washington Post detailing ties between Cuccinelli and Glen Allen-based Star Scientific, a former tobacco company that now sells dietary supplements. Cuccinelli owned more than $10,000 in Star Scientific stock in 2011 when the company sued the state over a tax assessment. A campaign spokesman said the stock, bought in 2010 and 2011, wasn’t reported until last year because Cuccinelli didn’t realize its value had exceeded the threshold for financial disclosure. Cuccinelli has reported receiving $13,000 in gifts from Star Scientific CEO Jonnie R. Williams Sr., including a brief stay at Williams’ Goochland County home in 2010. Star Scientific’s suit involves a $700,000 sales and use tax assessment on tobacco curing barns it owns in Mecklenburg County. If it loses the suit, the company could owe the state $1.7 million. Star Scientific, in turn, is a defendant in lawsuits filed by two shareholders stemming in part from a recently disclosed federal investigation into the company’s securities transactions. Star Scientific says the suits are without merit. Reacting to a barrage of criticism, Cuccinelli on April 5 appointed former Attorney General Stephen D. Rosenthal and former state Solicitor General William H. Hurd to handle the Star Scientific case at no charge to the state. On the same day that Cuccinelli recused his office, McAuliffe also was making news. The website Politico disclosed that the Democrat, best-known as a prolific fundraiser for Bill and Hillary Clinton, had quietly resigned as chairman of GreenTech Automotive in December. McAuliffe had bought GreenTech, a maker of small electric cars, from the Chinese government in 2009. 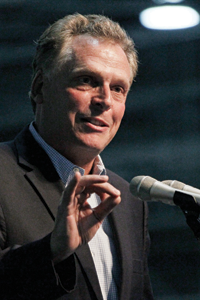 McAuliffe had been expected to locate GreenTech in Virginia to solidify his claim as a jobs creator. Instead, the plant sites wound up in Mississippi, home of McAuliffe’s good friend, former Gov. Haley Barbour. McAuliffe said he did not locate in Virginia because the Virginia Economic Development Partnership had shown little interest in the project. PolitiFact Virginia determined that claim was false. Emails, however, showed VEDP had concerns about GreenTech, including its proposed use of a federal program offering visas to foreigner investors who create U.S. jobs. Republicans pounced on McAuliffe’s resignation as proof that the GreenTech deal has gone bust. According to news reports, GreenTech has produced few cars at a temporary factory in Horn Lake, Miss., and little progress has been made on plans for a 300,000-square-foot permanent plant In Tunica, Miss. GreenTech also was late in paying taxes in Tunica. Before March 30, polls showed Cuccinelli and McAuliffe were in a virtual dead heat, with many voters saying they didn’t know much about either candidate. Political observers said the situation gave each contender an opportunity to “define” his rival, meaning pummel him with negative ads. Instead, Cuccinelli and McAuliffe now have been defined by bad press on their business ties. Not a good start for campaigns that planned to make the state economy their top issue. The gubernatorial contest already was suffering from a heavy dose of voter dissatisfaction. After dropping out of the race for the Republican nomination last year, Lt. Gov. Bill Bolling briefly flirted with the idea of running as an independent. In addition, Politico says Republican moderates in Northern Virginia have urged former U.S. Rep. Tom Davis to make a bid, so far with no success. The hearts of Democrats, meanwhile, were aflutter when popular U.S. Sen. Mark Warner, frustrated with the glacial pace of Washington, pondered running for a second term as governor before deciding to seek re-election to his Senate seat. If the race remains a two-horse field, neither candidate looks likely to inspire widespread enthusiasm among the electorate. 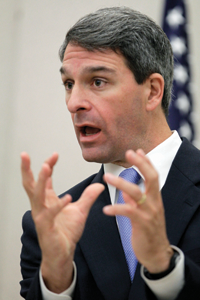 In Virginia, a low voter turnout typically favors Republicans, giving Cuccinelli the advantage. In this demolition derby, however, there probably will be no winner, just a survivor.